Take two parts Muammar Gaddafi. Add one part rebellion and a pinch of African and Eastern European mercenaries. Season with UN and NATO air strikes and let simmer. That is the dish being brewed in Libya. Every day, more news of nonsense comes out of that country. It’s worth summing up some of it and contemplating the chances for failure in light of this half-hearted foreign intervention. “War in the desert is warfare in its purest form.” Such were the words of Gen. Kress von Kressenstein upon observing the 1917 battle of Gaza, in which the British used tanks against the German defenses. But the rebellion in Libya is far from pure warfare. The battle for Libya is between feeble rebel units that display much bravado to reporters but little in battle, and Gaddafi’s wishy-washy army. Like the current conflict, World War II in Africa was a seesaw affair. In 1940 Italy – which occupied Libya – invaded British-occupied Egypt. But, like the Libyan rebels, the Italian army, despite its bravado, became bogged down and the British quickly beat it back toward Tripoli. In March 1941 the Axis forces, now reinforced with Erwin Rommel’s German units, overran the British and forced them back to Egypt, much like Gaddafi rolled back the rebels. The Germans surrounded several British units in Tobruk, near the Egyptian border, and laid siege to them for 240 days. In June 1942 Rommel once again defeated the British, this time forcing them to within 70 miles of Alexandria. But as we know, the war did not end there; the Germans were again driven back, this time for good. AS IN the desert war, the Libyan conflict has lurched from crisis to crisis. In late February, sporadic protests turned into a genuine rebellion. Rebels captured arms in Benghazi, capital of eastern Libya. For two weeks it seemed that the Libyan regime was finished. Newspapers printed maps showing most of Libya in rebel hands. But things apparently were changing. After defections by some army units, Gaddafi brought in African mercenaries to bolster his dwindling cadre of loyalists. By March 5, his army had been reorganized, and he unleashed it against rebel forces around Tripoli. There have been reports that Gaddafi’s offensive was bolstered by Eastern European mercenaries, who, unlike the African recruits, would have been familiar with Soviet equipment such as T-72 tanks. Whatever the case, by March 10 the government forces had recaptured Zawiya near Tripoli and Ras Lanuf, between Tripoli and Benghazi. By March 16, both Brega and Ajdabiya were in government hands. The rebels have repeatedly made blustery statements. Just prior to suffering a string of defeats around March 10, they had given Gaddafi mere hours to leave the country. They have made claims regarding recruitment, describing enlistment drives that armed 5,000 men and then another 8,000. But rebel spokesman Abdel Hafiz Ghoga claimed on March 20 that 8,000 rebels had been killed in fighting. The rebels have boasted of receiving defectors who have brought over tanks and airplanes. They possess at least a few warplanes, but one of them, a MiG-23, was shot down on March 19. They have fired rockets wildly and adorned themselves with belts of ammo to give the impression of being well-armed. They talk about receiving military aid from Saudi Arabia and Egypt. On March 16 it was reported that Khalifa Belqasim Haftar, a former Libyan commando officer, had returned to fight alongside the rebels. But the rebels show little military prowess. Nonetheless, they received a boost on March 17, when the UN imposed a no-fly zone over Libya. 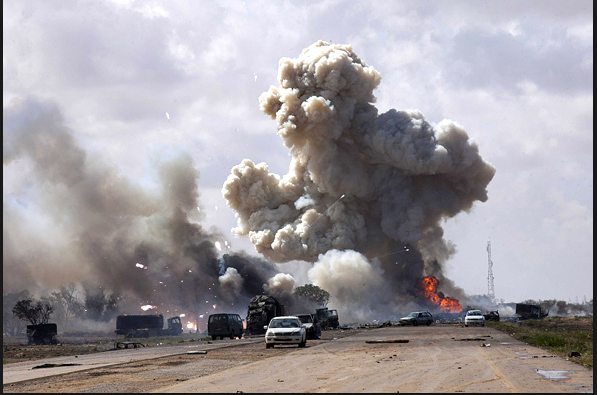 On March 19 French planes began bombing Libyan tanks in the suburbs of Benghazi. Further raids by British and American planes followed. So now the road for the rebels is once again open between Benghazi and Adjabiya. BUT THE central problem with the intervention in Libya is its lack of a goal. It is not about killing Gaddafi: US Defense Secretary Robert Gates has said it would be “unwise” to kill him, and UK Gen. Sir David Roberts claims his country hasn’t targeted him because the UN does not permit such action. It is not about helping the rebels: Adm. Mike Mullen, the chairman of the US Joint Chiefs of Staff, has said there could very well be a stalemate in the aftermath of air strikes, and both President Barack Obama and British MPs have said there are no plans for ground troops. Justin Crump, a contributor to Al Jazeera on military affairs, correctly notes that airpower is not a panacea, and will almost certainly not be enough to tip the balance against Gaddafi. The rebels seem incompetent. So unless the world is incredibly lucky, intervention there seems to be a recipe for a big mess. Unending conflict in Libya is not in the interest of anyone. With uncertainty already casting a pall over Egypt, Tunisia and increasingly over Yemen, Syria and Bahrain, and chaos having given rise to Hezbollah and Hamas in Lebanon and Gaza, it can’t possibly be good to have a long stalemate in Libya which, until a few months ago, had the highest GDP per capita in North Africa, at around $14,000 (Israel’s is $29,000). Egypt and Morocco were less than half that. Plunging a relatively wealthy country back into the dark ages, akin to Saddam’s Iraq between 1985 and 2005, is not good either. And getting Libyans hooked on foreign aid, like Kosovo, East Timor, Haiti, Gaza and some African countries, will also spell trouble. The dish being prepared in Libya needs to be tossed out in favor of a more positive future.